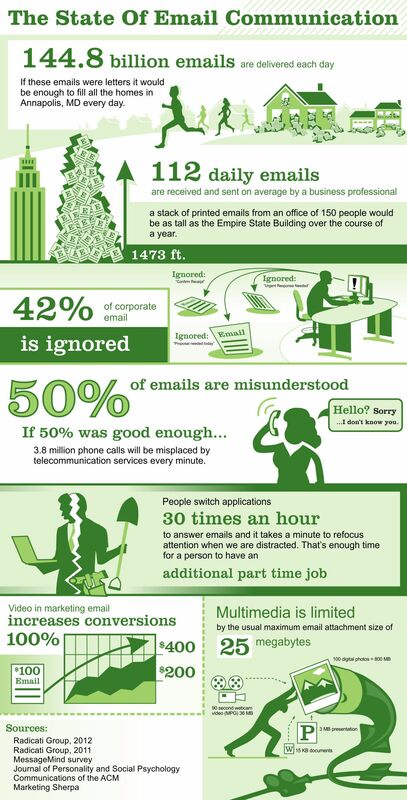 Almost half of the 144.8 billion emails delivered each day are ignored and fully half of those received are misunderstood, via680's State of Email Communication infographic illustrates. Via680, a portfolio company of the Youngstown Business Incubator (YBI), published an infographic that highlights the challenges with standard text-based email communications. The State of Email Communication shows that 144.8 billion emails are delivered every day and that 50% of all emails are misunderstood. The infographic elaborates on the challenges with including large attachments and multi-media with standard email programs. Ving, via680’s flagship product, is a web application that empowers users to create multimedia email messages, including videos, documents, voice memos, and surveys. These messages are distributed through email, social media, or text messaging. Dashboards show how recipients interact with email content. Via680 is offering forever free accounts to the first 10,000 people who create an account online at http://www.via680.com. After that, forever free accounts will be available by customer invitation only. The free accounts are simplified versions of standard accounts but still provide the core features that enable users to create, share, and track multimedia email. These accounts are being offered to collect customer feedback to help the company in its mission to reinvent email. via680’s mission is to improve the way people use email to communicate. Its software application, Ving, is a web-hosted service that empowers users to create multi-media messages with videos, documents, audio files, pictures and surveys. Secure messages are sent through email, social media and mobile messaging. Ving automatically confirms a message has been received, read, viewed, heard and understood with complete dashboard reporting. For more information, please visit the website at via680.com.